Tens of thousands granted Irish citizenship. Estimated 9,000 work permits issued 2016 to enable companies to hire workers from India, Pakistan and other non-EU countries. Countless undocumented migrants employed in the restaurant, catering, domestic, cleaning sectors. Nearly 129,000 out-of-state nationals have been granted Irish citizenship. Minister for Justice Frances Fitzgerald has revealed the details in response to a parliamentary question. She said that the number naturalised here between 2000 and 2016 ran to 128,500 approximately. She said that in the period 2000 to 2009, 17,400 foreign nationals received certificates of naturalisation. 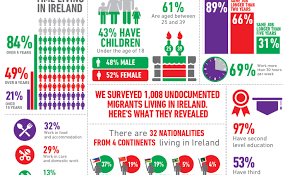 According to records, the government granted citizenship in Ireland to 24,262 people in 2013. In a recent radio interview, the leader of the newly formed National Party estimated that 850,000 immigrants had entered the State. In a submission to the Low Pay Commission, the Centre noted that “undocumented migrants are employed in a range of jobs across a number of sectors. Undocumented migrants are persons not having the official documents needed to enter, live in, or work in the country legally. Various bodies are piling pressure on the government to open the country to thousands more refugees in the immediate future. Ireland already has almost 7,000 ‘officially homeless’ persons. The figure has increased by over 40% in the last year alone. One in three of those in emergency accommodation is a child. Concern is growing over heightening pressure on health services, schools and the existing levels of unemployment among young Irish job seekers, particularly in the North West. In 2015, the government granted 7,353 work permits to non-EU citizens to work in Ireland. These were issued to foreign nationals from among other places India, Pakistan and Brazil. The figure for 2016 is expected to be about 9,000, with the number of permits increasing by 20% annually to enable companies to bring workers from abroad to Ireland. Data published cross-channel has confirmed that Britain’s foreign-born population has now exceeded eight million, indicating one in eight of those living there were born abroad.